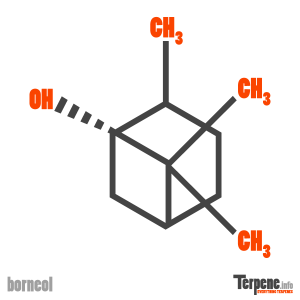 Borneol is a bicyclic monoterpene with a balsamy, camphor, herbal, woody scent. Borneol is commonly used in asian traditional medicine. Borneol has demonstrated more potent effects than the local anesthetic, lidocaine, and can also be eaten for its analgesic effects. Borneol has acted as an anticoagulant in stroke models, and alleviates the mechanisms of proinflammatory cytokines in general. The terpene has induced fungicidal activity against several species of fungi. In addition, borneol has elucidated to help drugs cross the blood brain barrier at a higher rate than without borneol. Borneol’s effect on the nicotinic acetylcholine receptor in cow adrenal chromaffin cells was investigated. Borneol was found to inhibit a nAChR agonist, DMPP. Sodium increase and secretion of norepinephrine were inhibited by the terpenol. The results showed borneol to be more potent than a commonly used local anesthetic, lidocaine. Borneol’s anticoagulant effects were demonstrated through inhibitory effects on arterio-venous shunt and venous thrombosis. Also prolonged the coagulation parameters for prothrombin time (PT) and thrombin time (TT)were seen in blood samples. In another study borneol’s effects were explored with stroke induced rats.Borneol was shown to significantly ameliorated ischemic. Reduced levels of pro-inflammatory mediators was also seen. Borneol was deduced to inhibit fibroblasts mitosis, collagen and TIMP-1 production. In addition, borneol had no cytotoxicity on mice oral fibroblasts. Borneol was found to be non selective at inhibiting growth and development of reproductive stroma of the plant pathogens Colletotrichum acutatum, Colletotrichum fragariae, and Colletotrichum gloeosporioides. There was also significant antimycobacterial activity observed against Mycobacterium intracellulare. Human gingival fibroblasts were exposed to a compound to stimulate the release of pro-inflammatory interleukins IL-6 and IL-8. Upon borneol administration the release of these pro-inflammatory interleukins was found to be reduced by more than 50%. Borneol was Elucidated to help increase the cellular uptake of two anti-cancer natural compounds selenocysteine and bisdemethoxycurcumin in liver cancer cells. Passing the blood brain barrier is important in administering many drugs. Borneol was proven to help increase concentrations of a polar natural compound kaempferol in rat brains. The total concentration of drug increased 2.09 and 3.18 and the brain-to-blood distribution ratio increased by 48.68% and 57.97% . Read through our forum on Borneol below, or start your own topic. This forum contains 238 topics, and was last updated by Lillysom 1 day, 14 hours ago.